Resolution options are handled awkwardly, forcing some systems to use blurry or improperly scaled graphics. See Resolution and Scaling. There is a demo available from either the official website or the Steam store page. The Prototype Pack portion is only available for Windows. 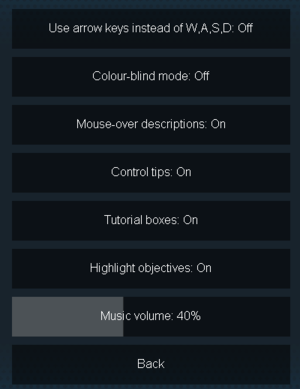 Selecting fullscreen with lower than native resolution changes whole OS resolution while game is open. Supports up to 1920x1200 only. See Widescreen resolution. Enable windowed mode and choose your desktop resolution in-game. The game's graphics don't scale according to resolution but are 1:1 pixels, this means with higher resolution you can see more and everything is much smaller. This means with some setups, especially smaller display sizes or playing further away from screen, it's better to play game with lower than native resolution. Playing under native resolution means display or GPU tries to upscale image. With pixel art graphics this makes game look blurry. 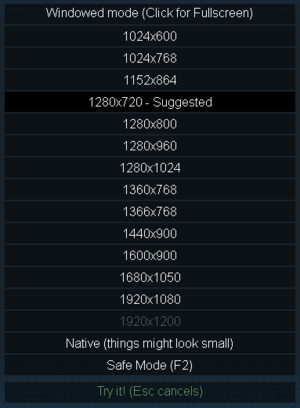 1280x720, the game's suggested resolution for 1920x1080 displays. The game offers a resolution and screen mode selection on first start-up, and in-game via 'Change res' option (hotkey F1). Game has been updated so that if resolution was incorrect you can cancel with Esc and menu is accessible even with first level. If something goes wrong you can press F2 to Safe mode which selects lowest resolution in windowed mode or edit resolution manually. Alt+Tab ↹ works flawlessly with fullscreen mode. Borderless Windowed can be used in conjunction with windowed mode to hide the taskbar if it is overlaying the game window. Caused by mismatch in game paths between different computers through Steam Cloud.